Draft: 2002, Milwaukee Brewers, 1st rd. Prince Semien Fielder…he and his wife Chanel have two sons, Jadyn (Aug. 17, 2004) and Haven (March 21, 2006)… is the son of Cecil Fielder, first baseman with the Blue Jays, Tigers, Yankees, Angels, and Indians from 1985-88 and 1990-98…Cecil had 319 career homers, including 51 with the Tigers in 1990, making Cecil and Prince the only father-son duo with 50-homer seasons…toured Beijing, China and Tokyo, Japan following the 2010 season to promote the game of baseball as part of the Major League Baseball International Ambassador program…wears uniform #84 with the Rangers due to fact he was born in 1984…was the Rangers' highest uniform number in the regular season since INF Rene Gonzales wore #88 in 1996. Earned Rangers Player of the Year honors in a bounce back season…started 139 games at DH and 18 at first base… ranked among the A.L. leaders in hits (third, career high 187), singles (third, 136), multi-hit games (tied for third, 57), IBB (tied for third, 14), OBP (fourth, .378), average (sixth, .305), RBI (ninth, 98), and games (tied for ninth, 158), and at bats (T10th, 613)…led the Rangers in average, at bats, hits, total bases (284), RBI, and OBP, tied for first in HR (23), and was second in games, go-ahead RBI (26), and GWRBI (12)…tied for eighth in A.L. in GIDP (career high 21). Started each of Rangers' 1st 42 games through 5/16 before a herniated disc in his neck ended his season...still led the club with 39 starts at first base and started 3 times as the DH...was tied for 5th in the A.L. with 25 walks as of 5/16 and led league with 11 IBB at that point...still tied for 7th in A.L. for the season in intentional walks, most since 2012 (18)...drew 9 intentional walks in April, an American League record for the month and club record for any month...had more walks (25) than strikeouts (24). Tied Billy Butler, Hunter Pence, and Joey Votto for the major league lead with 162 games…was one of 12 major leaguers with minimums of 25 homers and 100 RBI…ranked among the A.L. leaders in plate appearances (3rd, 712), go ahead RBI (T3rd, 29), game-winning RBI (T4th, 15), RBI (5th, 106), and at bats (9th, 624)…averaged an RBI every 5.9 at bats, 8th best in the league…set career high for at bats and tied for most games and doubles (36)…had his lowest slugging percentage (.457) and homer total (25) in a full season…led Detroit in games and at bats, was 2nd in home runs, RBI, and walks (75), and tied for 2nd in doubles…started 151 games at 1st base and 11 as the DH. The 2013 season will mark Fielder's second season with the Tigers...marks the second year of a nine-year contract heagreed to terms on with the club on January 27, 2012. ... Three-time National League all-star selection with the Milwaukee Brewers (2007, 2009, 2011)...selected to theAmerican League all-star squad with the Tigers in 2012. ... Won two National League Silver Slugger Awards with the Brewers (2007, 2011)...won one American League SilverSlugger Award with the Tigers (2012). ... Earned National League Player of the Month honors in May of 2007 and June of 2011. ... Selected National League Player of the Week four times during his career ... Elected the American League's starting first baseman for the All-Star Game in his first season with the Tigers in 2012 --marked the fourth all-star selection of his career and the third time he has been elected a starter (also, 2007 and 2011). ... Belted 28 home runs as he won the State Farm Home Run Derby on July 9 in Kansas City, marking the second timehe has won the home run hitting contest (also, 2009 in St. Louis) -- joined Ken Griffey, Jr. as the only players to win thecontest multiple times. ... Second in the American League with a .412 on-base percentage, while he finished fifth with 108 RBI, sixth with 85walks, tied for sixth with a .313 batting average, finished seventh with a .528 slugging percentage, tied for ninth with182 hits and finished 10th with 307 total bases. ... Saw action in all 162 games during the season, one of three players in the American League to do so -- has played in343 consecutive games dating back to September 14, 2010...marks the longest active streak in the major leagues. ... Hit by a pitch 17 times, tied for the lead in the American League -- his 17 hit by pitches are tied for fifth-most infranchise history. ... Earned the third Silver Slugger Award of his career, his first in the American League. ... Named to The Sporting News' American League all-star squad following the season. ... Belted 30 home runs, marking the sixth consecutive season he has hit 30-or-more home runs. ... Belted a season-high two home runs on April 7 versus Boston -- matched the high with two home runs on August 17versus Baltimore. ... Singled off Clay Buchholz in the first inning on April 8 versus Boston for the 1,000th hit of his major league career. ... Hit .309 (25x81) with two doubles, three home runs and 11 RBI in 22 games during April. ... Compiled a season-best 14-game hitting streak May 24-June 7, batting .423 (22x52) with four doubles, a triple, twohome runs and 12 RBI. ... Collected a season-high four hits on May 26 at Minnesota -- matched the high with four hits on October 1 at KansasCity. ... Selected the Tigers Player of the Month for May -- batted .330 (38x115) with nine doubles, a triple, five home runs and22 RBI in 29 games during the month...tied for fifth in the American League with 22 RBI during May, while he tied forsixth with nine doubles and finished ninth with a .330 batting average. ... Posted a 12-game hitting streak July 1-16, batting .348 (16x46) with two doubles, three home runs and 13 RBI. ... Batted .315 (28x89) with three doubles, four home runs and 20 RBI in 26 games during July -- tied for sixth in theAmerican League with 20 RBI during the month. ... Tabbed the Tigers Player of the Month for August -- hit .370 (34x92) with six doubles, seven home runs and 21 RBI in27 games during the month...topped the American League with a .370 batting average during August, while he tied forthird with seven home runs and tied for eighth with 21 RBI. ... Hit .337 (94x279) in 81 games at home...batted .291 (88x302) in 81 games on the road. ... Batted .299 (96x321) in 86 games prior to the all-star break...hit .331 (86x260) in 76 games following the all-star break. ... Batted .328 (119x363) with righthanded pitchers on the mound...hit .289 (63x218) with lefties on the mound ... Hit .338 (51x151) with runners in scoring position, 10th-best in the American League. Garnered the second Silver Slugger Award of his career as he finished second in the National League with 38 homeruns and 120 RBI for the Milwaukee Brewers during the 2011 season...Selected to the National League's all-star squad for the third time in his career, starting at first base for the second time in his career -- belted a three-run home run off Texas' C.J. Wilson and he was selected the Most Valuable Player of the All-Star Game in Arizona...Led the National League with 162 games played, while he finished second with 107 walks and a .415 on-base percentage, third with 322 total bases and a .566 slugging percentage, tied for third with 75 extra-base hits, tied for seventh with 95 runs scored and tied for ninth with 36 doubles...Belted 38 home runs for Milwaukee, marking the fifth straight season he connected for 30-or-more home runs -- became the first player in Brewers franchise history to hit 30-or-more home runs in five straight seasons...Drew 107 walks during the season, the third consecutive season he walked 100-or-more times -- marked the first time a player in Brewers history drew 100-or-more walks in three straight seasons...Selected to Baseball America's First-Team Major League all-star squad following the season...Named to The Sporting News' National League all-star squad following the season...Rated as possessing the best power and the third-best strike-zone judgement in the National League by Baseball America...Tabbed the National League Player of the Week for April 4-10 after hitting .440 (11x25) with four doubles, two home runs and 11 RBI in seven games -- earned National League Player of the Week honors for a second time during the season, doing so June 6-12 after batting .500 (10x20) with two doubles, six home runs and 13 RBI in seven games...Second in the National League with 26 RBI during April -- hit .333 (32x96) with nine doubles, a triple and six home runs in 25 games during the month...Belted the 200th home run of his major league career on May 11 versus San Diego, a two-run home run off Tim Stauffer...Connected for two home runs on June 8 versus the New York Mets...Posted an 11-game hitting streak June 17-29, batting .371 (13x35) with two doubles, two home runs and 10 RBI...Selected the National League Player of the Month for June -- hit .337 (28x83) with four doubles, 10 home runs and 27 RBI in 27 games during the month...led the National League with 27 RBI during June, while he tied for the lead with 10 home runs...Compiled a 10-game hitting streak August 2-13, batting .447 (17x38) with four doubles, three home runs and 13 RBI...Third in the National League with 26 RBI during August...Collected a season-high four hits on September 2 at Houston...Recorded a season-high 12-game hitting streak September 6-19, batting .333 (14x42) with three doubles, three home runs and five RBI...Established a career high with three home runs on September 27 versus Pittsburgh -- collected a season-best five RBI...Batted .330 (29x88) with six doubles, nine home runs and 18 RBI in 25 games during September -- led the National League with nine home runs during the month...Hit .314 (49x156) with runners in scoring position. Enjoyed one of the best seasons in franchise history as he batted .299 with 46 HR and 141 RBI in 162 games...Finished fourth in National League MVP voting behind the Cardinals' Albert Pujols, Marlins' Hanley Ramirez and Phillies' Ryan Howard...Was named Brewers Most Valuable Player as voted on by members of the Milwaukee Chapter of the Baseball Writers Association of America...Was the only player in the Major Leagues in 2009 to appear in each of his team's games...all of his games played were starts at first base, batting cleanup...Ranked among the National League leaders in RBI (T1st, 141), home runs (2nd, 46), OPS (2nd, 1.014), slugging percentage (2nd, .602), total bases (2nd, 356),extra-base hits (3rd, 84), walks (4th, 110), on-base percentage (5th, .412), multi-hit games (5th, 54) and runs (6th, 103)...Tied the Phillies' Ryan Howard for the Major League leadin RBI (141)...joined Cecil Cooper (1980 & 1983) as the only players in franchise history to accomplish the feat...His 141 RBI set a new franchise record, breaking the mark of 126 held by Cecil Cooper in 1983...His 110 walks set a new franchise record, breaking the mark of 99 held by Jeromy Burnitz in 2000...Became the first player in franchise history to produce three consecutive 30+ HR and 100+ RBI seasons...Had the sixth 40+ HR season in franchise history...his 46 HR trailed only his own mark of 50 from 2007...Joined Richie Sexson (2001 & 2003) as the only players in franchise history to have two 40+ homer seasons...Committed just 7 errors at first base after making 17 the previous season...Was selected to his second All-Star Game...produced apinch-hit RBI-double off the Blue Jays' Roy Halladay...Won the State Farm Home Run Derby, defeating the Rangers' Nelson Cruz in the final round. Batted .276 with 34 HR and 102 RBI in 159 games, all of which were starts (155g at 1B, 4g at DH)...Ranked eighth in the National League in home runs (34)...Recorded four 2-homer games: 4/23 vs. Philadelphia, 6/22 vs. Baltimore, 8/2 at Atlanta and 9/16 at Chicago-NL...Belted a game-winning 2-run homer in the 10th inning on4/17 at St. Louis (off Brad Thompson) to snap a streak of 53 at-bats without a home run to begin the season...On 6/19 vs. Toronto hit his second career inside-the-park home run (off A.J. Burnett)...Produced a walkoff RBI-single off Tyler Yates to give the Brewers a 2-1 win on 7/5 vs. Pittsburgh...On 7/19 at San Francisco became the fastest player in team history to reach 100 career homers (449 G)...broke the record of Geoff Jenkins (556 G)...the record was since broken by Ryan Braun (400 G)...also became the youngest player (24 years, 71 days) in team history toreach 100 homers...he broke the record previously held by Sixto Lezcano (26 years, 266 days)...From 7/28-8/9 had a 12-game hitting streak during whichhe batted .341 (15-for-44) with 6 HR and 9 RBI...Was named National League Player of the Week for 9/15-9/21 (12-26, .462, 3 HR, 11 RBI)...Smacked a 2-run walkoff homer off T.J. Beam to give the Brewers a 7-5 win on 9/23 vs. Pittsburgh...marked the second walkoff home run of his career...Tied his career high with a 17-game hitting streak from 9/9-9/27 (27-66, .409, 6 HR, 19 RBI)...Was named Brewers Player of the Month for September (.316, 6 HR, 21 RBI). Entered the season as the #1 prospect in the Brewersorganization according to Baseball America...Was named Brewers Top Newcomer as voted on bymembers of the Milwaukee Chapter of the BaseballWriters Association of America...Finished seventh in the National League Rookie of theYear voting...Named to the Topps Major League Rookie All-Star Team...Batted .271 with 28 HR and 81 RBI in 157 games in hisfirst full season.....had 151 starts (150g at 1B, 1g at DH)...Led the Brewers in games played, at-bats (569), hits(154) and multi-hit games (41)...Led National League rookies in homers (28) and rankedamong NL rookie leaders in RBI (3rd, 81), extra-base hits(3rd, 64), runs (4th, 82), total bases (4th, 275), doubles(4th, 35) and multi-hit games (5th, 41)...His 28 home runs were a Brewers rookie record.....theprevious record was held by Greg Vaughn (17hr, 1990)...His 81 RBI were a Brewers rookie record.....the previousrecord was held by B.J. Surhoff (68rbi, 1987)...Broke the record for the most homers in a rookie seasonby the son of a Major Leaguer (Jose Cruz Jr., 26hr, 1997)...Was named National League Rookie of the Month forApril (.344, 5hr, 16rbi)...Was one of five Brewers (Hall, Miller, Clark & Hardy) tohomer in the fourth inning on 4/22 vs. Cincinnati.....wasthe fifth time in Major League history that a team hit fivehome runs in one inning.....Fielder hit the fifth home runof the inning. Ranked as the 15th-best prospect in all of baseball and second overall in the Brewers organization by Baseball America prior to the season...Finished the season ranked as Milwaukee's top prospect and Best Power Prospect in the PCL by Baseball America...Began the season with Triple A Nashville where he batted .291 (110-for-378) with 28 home runs to go along with 86 RBI in 103 games...His 28 homers ranked fifth in the Pacific Coast League...Named Pacific Coast League Batter of the Week, May 23-29...hit .360 (9-25) with seven roundtrippers and 16 runs batted in during the stretch...His contract was purchased from Triple A Nashville on June 13...made his Major League debut June 13 at Tampa Bay...Collected his first Major League hit, a double off Hideo Nomo, and drove in his first big league run with his second hit of the night, also a double, in the ninth inning on June 15 at Tampa Bay...Hit his first career homer, a pinch-hit three-run shot off Jesse Crain, June 25 vs Minnesota...the roundtripper was also his first career hit at Miller Park and marked his first multi-RBI game...Optioned to Nashville on July 4...Recalled by Milwaukee on August 17...took the place of outfielder Brady Clark, who was placed on the Disabled List...Recorded his second career pinch-hit home run and his first career walk-off home run on August 31 vs. Pittsburgh with a two-run shot off Jose Mesa...was the first walk-off home run of the season by a Brewer...Hit .308 (8-26) in the pinch with a pair of home runs and nine RBI...Batted .353 (6-17) with runners in scoring position with a home run and eight RBI...that average improved to .429 (3-7) with RISP and two outs. Named Minor League player of the year by USA Today...Spent the season with Double A Huntsville where he hit .272 with 23 home runs and 78 RBI in 135 games...Finished the season with the following rankings in the Southern League: extra-base hits (T3-53), runs batted in (T4-78) and doubles (T8-21)...Represented the Huntsville Stars at the All-Star Classic and played in the 2004 All-Star Futures Game at Minute Maid Park in Houston...Hit .290 with 16 dingers and 41 RBI in 68 home games...Hit over .300 in April (.306, 22-72, 6 HR, 15 RBI) and September (.381, 8-21, 1 HR, 5 RBI)...Homered in four consecutive games, April 29-May 1 (May 1 was a doubleheader)...Recorded season-best, seven game hitting streak August 6-12...also had a pair of six-game hitting streaks...Drove in a season-best four runs on July 15 vs. Montgomery going 3-3 with a pair of doubles...Collected multiple hits in 39 games including 16 three-hit games...Had season-best four-hit contest going 4-5 with a double and two runs batted in on July 1 vs. Mobile...Played 133 games at first base, one game in left field, one game in right field and one game as the designated hitter. 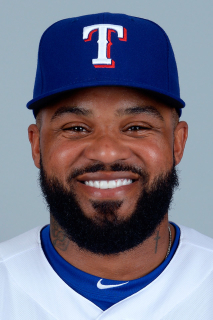 October 4, 2017 Texas Rangers released DH Prince Fielder. February 14, 2017 Texas Rangers placed DH Prince Fielder on the 60-day disabled list. Disc herniation in neck. November 7, 2016 Texas Rangers activated DH Prince Fielder from the 60-day disabled list. August 1, 2016 Texas Rangers transferred DH Prince Fielder from the 15-day disabled list to the 60-day disabled list. Left arm weakness and neck discomfort. July 20, 2016 Texas Rangers placed DH Prince Fielder on the 15-day disabled list retroactive to July 19, 2016. Left arm weakness & neck discomfort. November 3, 2014 Texas Rangers activated DH Prince Fielder from the 60-day disabled list. January 26, 2012 Detroit Tigers signed free agent Prince Fielder. October 30, 2005 1B Prince Fielder elected free agency.